If your Leclerc loom is missing some of the basic components like Aprons, Lease sticks of Crank Handles, Camilla Valley Farm stocks a wide range of genuine Leclerc parts to get it back in working condition. If you are unsure of the piece(s) you are missing, just contact us and we will be glad to help you get what you need! Also note that we have many, many more parts in stock than we show on this page and we can also get custom components made. Just ask if you don't see it here! Not Sure What Leclerc Loom You Have? Check out our Leclerc Loom Guide to determine which model of Leclerc loom you have so you order the correct part. Our online collection of Leclerc Loom Manuals provide assembly information and parts lists for most products! 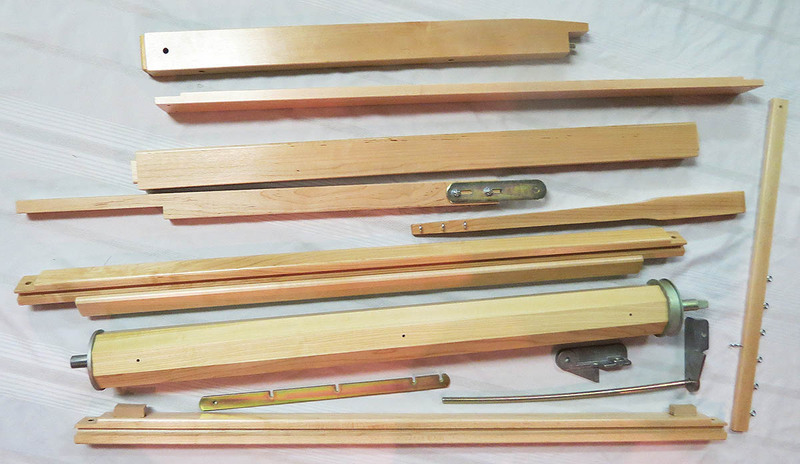 Available in either metal or wood, these Lease Sticks are used to hold the cross together when warping the loom. They have holes in the end to tie them together and/or to the loom frame for support. Leclerc Looms are normally shipped with 2 of these. These round steel rods are used to tie the warp threads to the canvas apron on the warp and cloth beam or to beam sticks. The same bar is used to attach warp threads to the sectional warping beam if the loom is so equipped. 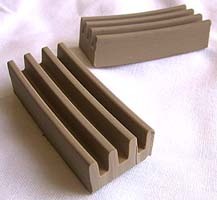 The standard warp rods shipping with looms for years have a 5/16" diameter. For high tension weaving like rugs a heavy duty version of the warp rod with a diameter of 7/16" is also available in some lengths. Normally 4 warp rods are needed for each loom. 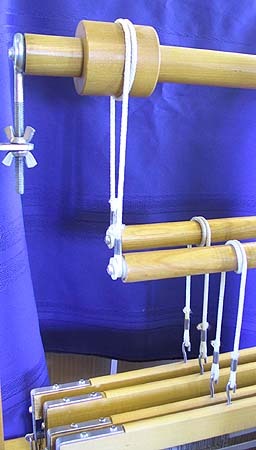 These metal or wooden rods are used instead of canvas aprons to attach the warp threads to the warp and cloth beams. They have a series of holes which are used to tie it to the warp/cloth beam using a lashing cord. Normally 2 are shipped with each loom. These wooden warp sticks are useful when beaming a long warp. They are placed on the warp beam to separate layers of warp yarn as it is wound on the beam to maintain perfect tension and to prevent edge threads from slipping down. 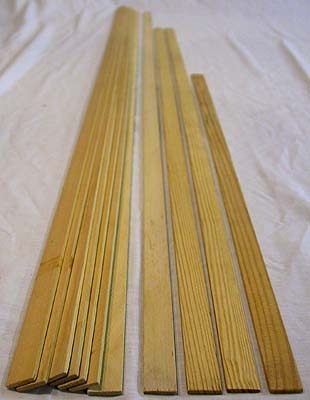 Two (2) warp sticks are used per turn of the warp beam and each warp stick is 3/4 inch (19 mm wide and about 1/8 inch (2 mm) thick. These warp sticks are sold in packs of one dozen (12). These cords are used on the Mira and Fanny counterbalance loom families (including the older F and M series looms). 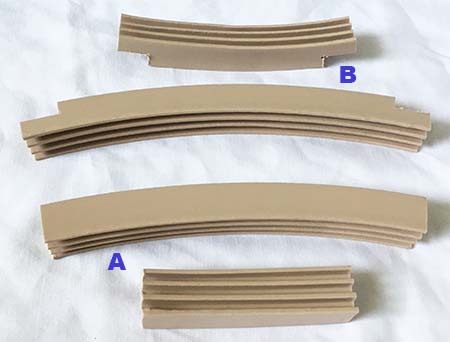 The upper set of cords (A, B and C) connect the two lower rollers together and wraps around the upper roller. The lower cord set connect the lower rollers to the Shaft Frame Hooks on the shafts. The cords are made of a durable braided nylon or cotton for durability. 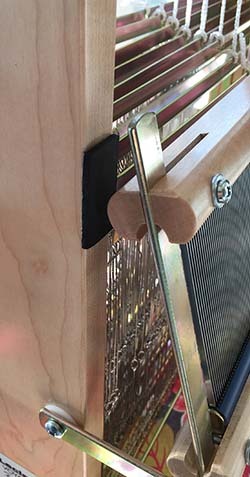 Replacing the upper cords will require the removal of a screw holding the old pulleys (or hooks on older looms) with a square bit screwdriver that is normally found with the loom. If missing, this screwdriver set is available which can also be used to remove or tighten other parts of the loom. 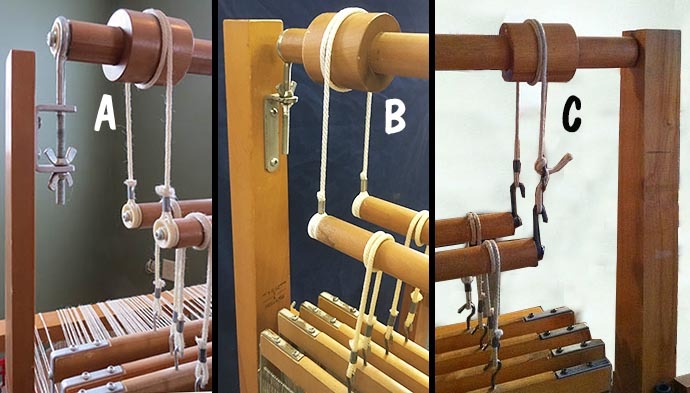 There are 3 sets of upper roller cords that are designed to fit looms configured with the 3 primary ways the upper roller was attached to the frame (all three are shown below). The current "C" shaped (A) and the older "L" shaped (B) brackets allow the height of the shafts to be adjusted by moving the upper roller up and down. 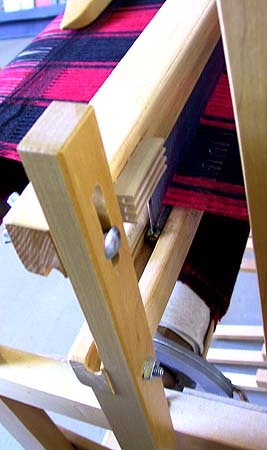 On the older looms with the fixed height roller (C), the cord length is adjustable. 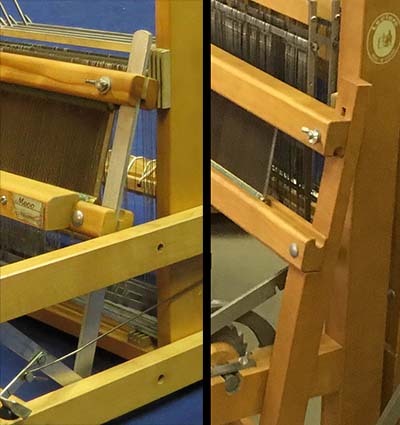 On these looms, the upper cords also replace the hooks on the end of the lower roller with the improved nylon pulley system. Note: The older fixed upper roller systems (C) can be converted to the newer improved "C" bracket system (A) with these parts. 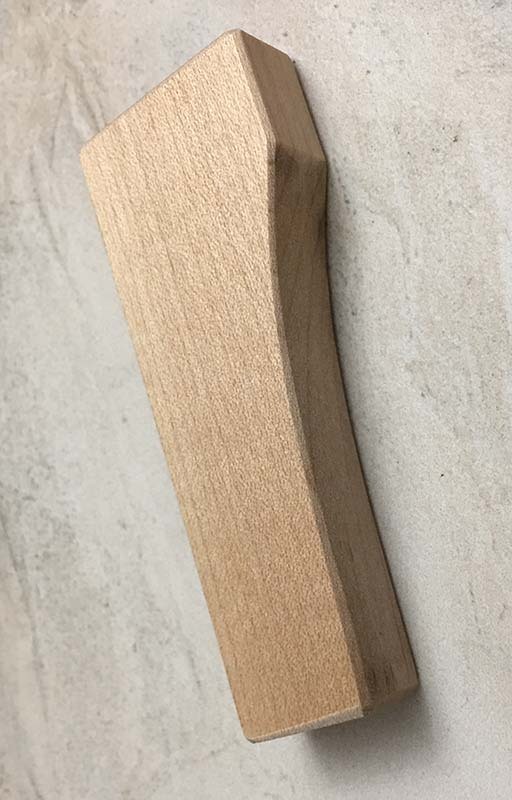 Note that the upper roller has to be shortened slightly by cutting a small piece off of each end. All three systems can also be converted by adding a Shed Regulator like the Mira II and Fanny II to allow better handling of unbalanced weaves. These nylon cords are designed not to stretch over time and have all been cut to a standard length. 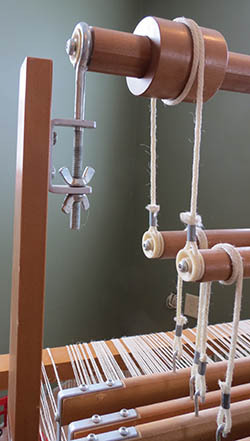 They connect each treadle to one or more lams using the treadle hook. 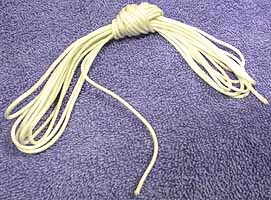 This nylon braided cord is strong and durable and does not stretch when tension is applied. It is wonderful for many weaving applications. It is supplied with Leclerc Bergere and Penelope II looms to lash the warp rods to the warp and cloth beams as well as the Leclerc floor looms to lash to the approns. The cord comes in 5 yard (4.5m) or 16 yard lengths (14.0m) and is approximetly 1/8" in diameter. On new 36 and 45 inch looms, Leclerc recommends that the 5 yard cord be cut in half with one half being used to lash (or lace) the warp beam and the other to be used on the cloth beam. On a 60 inch loom they recommend using a full 5 yard cord on both beams. 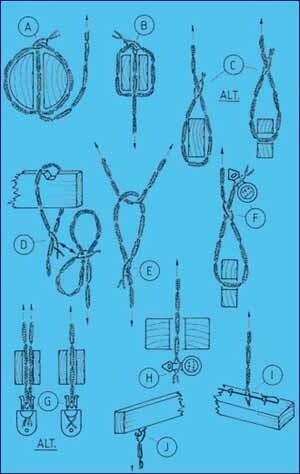 Texsolv Loop (or Chain) Cord consists of two parallel nylon ropes that are locked together at regular intervals forming a continuous series of regular loops. This "crocheted" polyester cord is extremely durable and knotless and can be quickly and securely fastened together in a number of different ways as shown to the left. 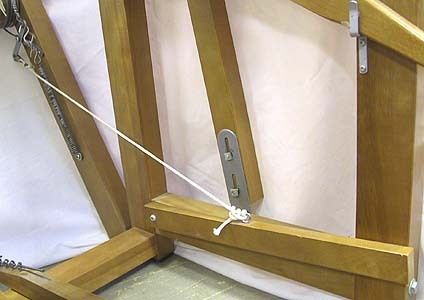 Leclerc uses Loop Cord in a number of different applications including lashing for the Dorothy and Voyageur table looms, for treadle tie-ups on some of the floor looms and for supporting the Back-hinge treadles on looms equipped with these. 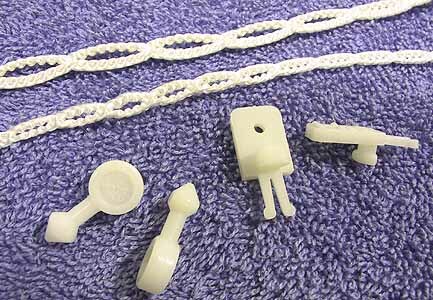 There are also two types of Nylon Anchor pegs which can be used in conjunction with the cord for fast connection and adjustment. The loop cord is available by the yard in either a large or small size. The large size is thicker and has loops every 3/4 inch while the loops are every 1/2 inch in the small cord. The pegs are approx. 1 inch in length and are shown below. Many early Leclerc looms connected the brake mechanism at the back to the front brake lever using a brake cord. Pushing on the lever pulled on the cord which loosened the brake coil allowing the warp beam to turn. See the picture below and the ones at the Floor Loom Brake Parts section. This Leclerc Brake cable is made using a thick woven cord for strength and durability. It has a loop at one end to connect to the brake mechanism and the other end is tied to the wooden brake lever at front. The cord is 2 yards (72 inches) long to allow it to be used for any loom configuration including the brake on the Double Warp Beam which sometimes has to take an indirect route. 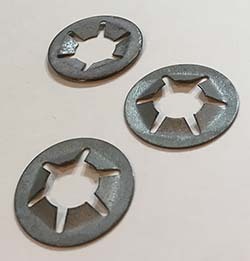 These rubber pads (shown below left) are designed to dampen the impact of the beater bar on the floor loom castle and avoid damage to the wood frame and beater. 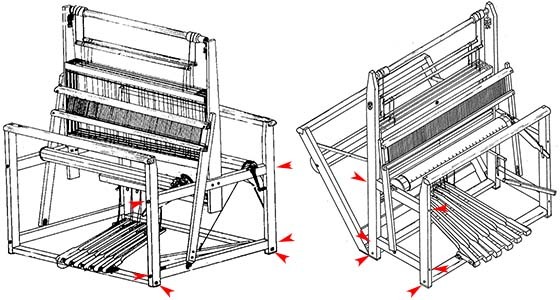 Depending upon the loom, either a single pad is used on the beater on each side, or pads are attached to both the beater and the frame. The bumper pads are normally pin-nailed to the loom frame but can also be fastened between the ribs with small finishing nails. Another option is gluing them, but the ribs on one side don't make the best surface for this. We can modify them by cutting off the back ribs as shown in the picture below to the right for a little higher charge. 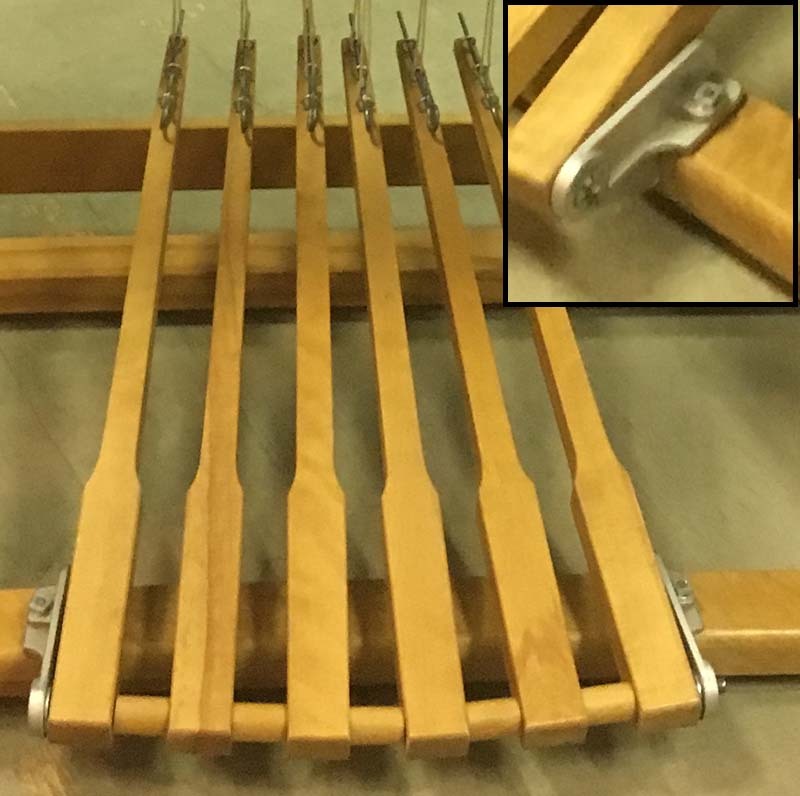 These rubber pads are attached to the front of the castle on Leclerc table looms like the Dorothy, Voyageur and other older table loom models to protect the wood from damage from contact with the beater. They are self-adhesive and come in a set of two. These non-skid polyvinyl pads are mounted to the base of all the wooden parts on Leclerc floor looms that come in contact with the floor. They are designed to stop the loom from moving as the weaver beats and to protect the floor and loom from scratches. They are made from a very durable polyvinyl material and are 2 3/8 by 1 1/2 inches in size and 5/16 inch thick with a ridged base. 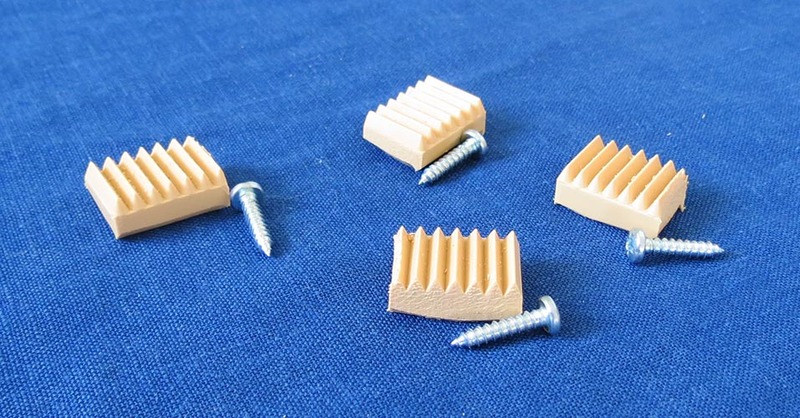 These can be stapled, glued, screwed or nailed in place. The number required per loom varies with the specific loom design. 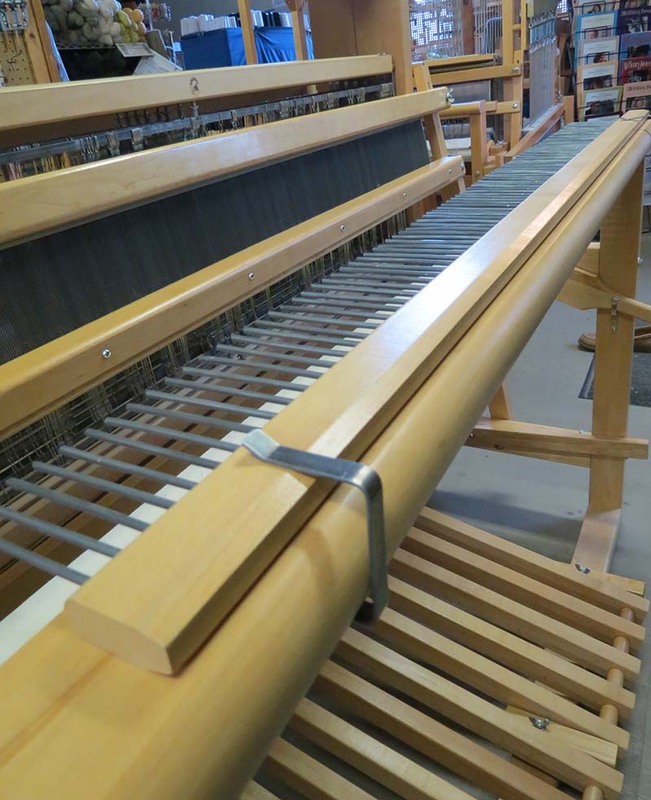 Note that if these pads are being used to replace some of the original black rubber pads and the others black pads on the loom have worn down over time, it is recommended that the pad on both the left and right side be replaced to avoid having the loom rock side to side. These non-skid polyvinyl pads attach to the base of Leclerc Table Looms like the Dorothy, Voyageur, Meco, Medico, Nilec and Jano. Like the larger floor loom pads they are designed to stop the loom from moving as the weaver beats and to protect the table and loom from scratches. They are made from a very durable polyvinyl material and are 7/8 by 5/8 inches in size and 3/8 inch thick with a ridged base. 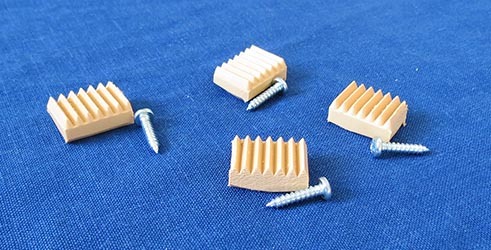 These can be glued, pin-nailed or screwed in place. The number required per loom varies with the specific loom design. These nylon pads are installed on the Artisat, Nilus and Nilus II jack looms on the top of the jack box. 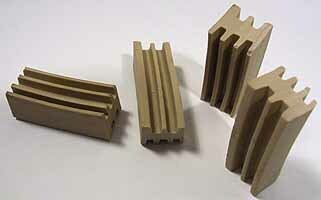 The are designed to cushion the impact of the shafts as they drop back in place. Two are required for each loom and they are pin-nailed or screwed to the jack box. There are two styles of these and two different sizes of each. Older style Leclerc Jack looms had the bumpers installed on either side up against the castle sides (A) while the newer style (B) have a cutout at each end and are mounted close to the center of the jack box. 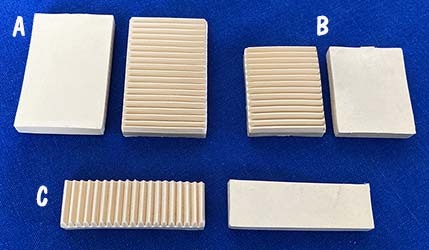 The older style were usually a softer black rubber as pictured to the left. 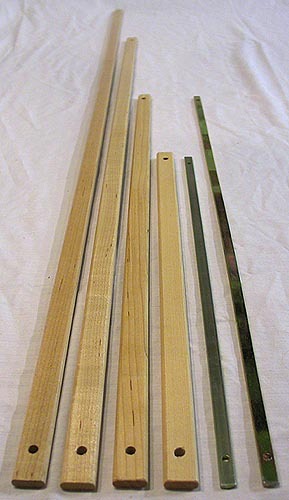 A different size of each style is available for 4 shaft and 8 shaft looms. Note that these bumpers are available in different lengths for other Leclerc looms with more shafts. Contact for pricing and more information. 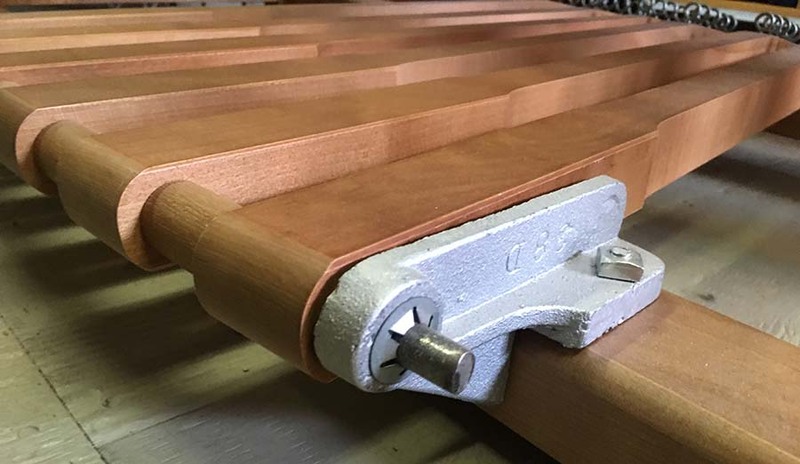 These handy clips are used to attach the Leclerc Raddle to the front or back Breast Beam on Leclerc floor looms during the warping process. 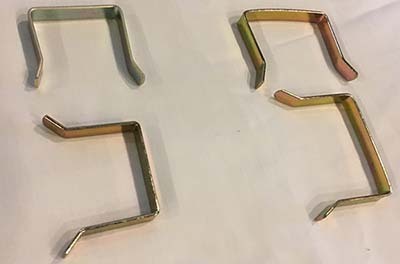 Made of metal, these clips are normally included with the Raddles but are often go missing. 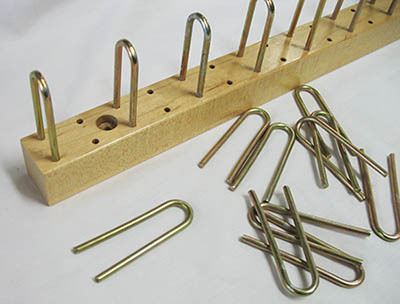 The price below is for a set of 2 clips and small and large versions are available to fit the different loom models. These parts are used on either side of the loom to mount the upper roller on Leclerc Mira and Fanny Counterbalance looms. The Upper Roller Support has Nylon Inserts and two wingnuts that can be adjusted along the threaded shaft to raise and lower the upper roller and then lock it in place. 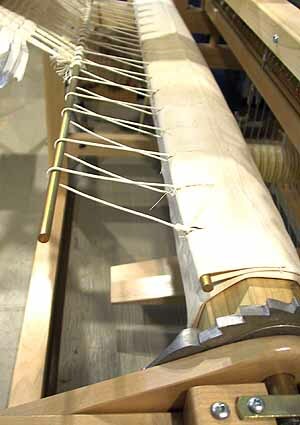 This mechanism allows the weaver to control the height of the shafts to position the warp threads relative to the reed. The "U" shaped brackets mount to the loom frame and include 2 screws. To convert older Leclerc Counterbalance looms to this system, two of each part are required. Note that the existing upper roller may have to be shortened slightly on each end to fit the new mechanism. These parts are not needed if the older loom is converted with the Shed Regulator Option used on the current Mira II and Fanny II models. These heavy metal brackets are used to repair broken brackets on Leclerc Sectional Beam rakes or convert a rake beam with 2 inch spacing to 1 inch spacing. They brackets are tapped into place using a hammer and a block of wood. These bolts are used to fasten the frame parts together for the Fanny, Mira and other Leclerc looms. Each bolt includes a washer and the special square nut that grips to the edges of the hole in the frame to allow the head of the bolt to be easily tightened with just a 9/16" wrench without turning the loom upside down or lifting it to put a wrench on the nut. 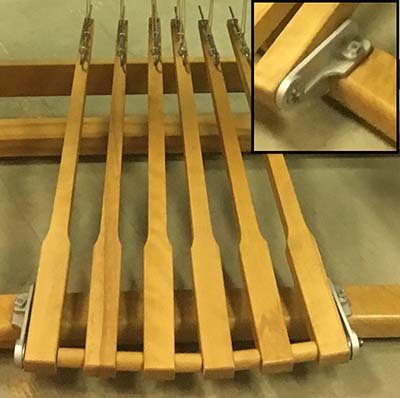 There are 12 bolts on the standard Mira and Fanny loom (6 on each side) and the distance between the outside of the frame and the edge of the hole where the nut is installed should be about 4 to 4 1/4 inches. 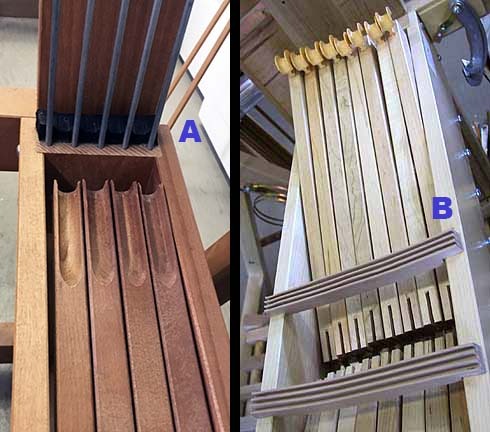 The bolt locations on a single side of each loom (Mira left, Fanny right) are shown in the picture below (Click to enlarge). These bolts are used to fasten the horizontal Batten Handtree and Batten Sley to the vertical Swords on each side of the loom beater. There are a total of 4 bolts. The 2 lower bolts have square nuts and are always kept tight to position the beater frame. The 2 upper bolts have wing nuts that face the weaver and are loosened to raise the Batten Handtree so the Reed can be removed and installed. The smaller bolts are used on the Meco table loom (pictured left) and the larger are used on the Mira, Fanny, Nilus, Nilus II, Colonial and most other Leclerc Floor looms. These bolts are used to fasten the metal brackets of the treadle set to the lower frame beam of most Leclerc floor looms like the 4 shaft Mira, Fanny and Nilus. A set of 2 bolts is provided, each with a square nut. Note that these only work for the curved set of 6 treadles with the metal mounting brackets. Contact us for pricing on the bolts for other models. These wooden pegs are used to hold the frame together on the original Colonial loom. They are normally tapped in place with a rubber hammer and hold the frame securely even when the loom is being beaten heavily. Note that these pegs are not used in the other versions of the Colonial like the Colonial I and the Colonial v2 which use bolts to hold the frame together. These pegs are made from Maple Hardwood and 8 pegs are used on the Colonial loom. (Click to enlarge). These metal plates are used to attach the wooden beater swords to the loom frame on floor looms like the Fanny, Mira, Nilus, Nilus II and Colonial. They allow the beater height to be adjusted by about 1 inch to make sure the beater is positioned properly in relation to the warp threads. 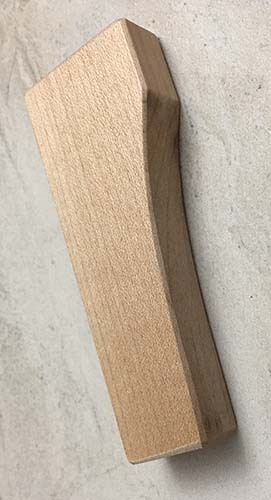 By loosening the pair of nuts on each side, the wooden sword can be moved up or down. The kit includes 2 of the mounting plates as well as the bolts/nuts used to fasten the plate to the wooden sword. A set of lag screws to attach the plates to the frame are also included but in newer looms a set of bolts/nuts bolts may be required. Contact us if these are required. 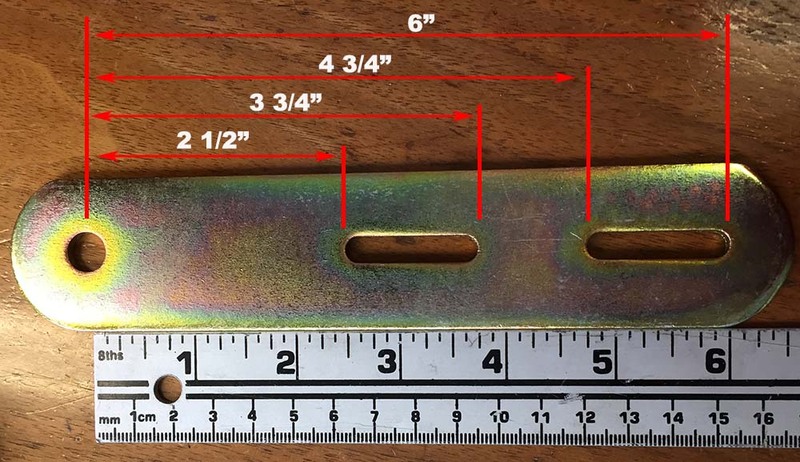 Note that older Leclerc looms had beater mechanisms that did not have this adjustment plate but they can be upgraded by cutting off the end of the swords and drilling a set of holes to attach the plate and using the shorter lag screw included. Some older Leclerc floor looms used a slightly different version of this plate. The picture located here includes measurements to determine if the plate will work with these looms. On most Leclerc floor looms like the Fanny, Mira, Nilus and Nilus II the treadle set is mounted using two brackets which attach to the frame. The metal treadle rod is attached to the bracket on one side, but just fits through a hole in the other side to allow the treadle parts to be removed. To keep the rod from coming out of the bracket, a flat metal lock nut is inserted on the outside end of the treadle rod and pushed in until it is up against the bracket. This lock nut is designed to move only one way and can not normally be removed without destroying it. 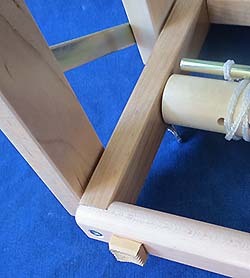 To re-install the wooden treadles and spacers after taking the treadle set apart, another flat lock nut is usually required. The part numbers below are for a single Treadle Lock Nut. 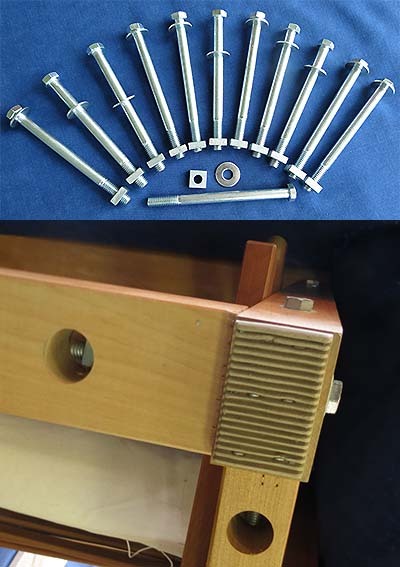 The standard lock nut fits most looms including the Artisat, Minerva and Table loom Treadle Stands. A special smaller Lock Nut is used on the Compact and 4 are required as they are used to secure the Brake Treadle as well as the shaft treadles. Specify the specific loom with the order note section to ensure you get the correct size. Note: The old lock nut can normally be removed by prying the space between the nut and the bracket using a large screwdriver or cutting one side of the nut with a pair of pliers. 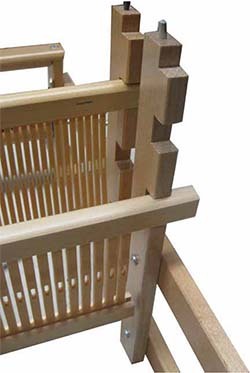 This kit adds a second set of heddle support bracket to the Leclerc Bergere Rigid Heddle loom to allow two rigid heddles to be used while weaving. 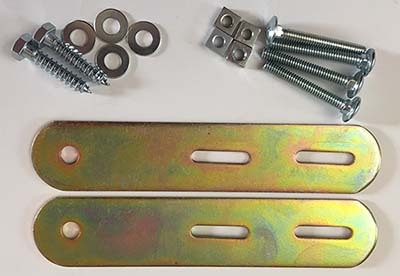 The brackets are mounted in front of the existing ones and a set of screws is provided alonge with mounting instructions. The kit includes a bracket for each side and instructions are shown in the Bergere section of our Manual page. Contact us at nmanners@camillavalleyfarm.com and we will try to help. Note that it often helps for us to have clear pictures of your loom to identify the specific model and version and avoid providing the incorrect product. Our Leclerc Loom Identification Page will help you determine the specific model. 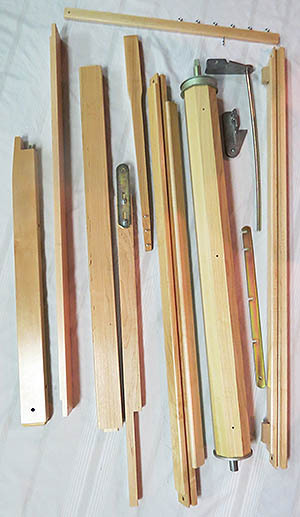 Note that these pages contain only a small selection of parts available for Leclerc weaving looms. If you require a part not shown on this or any other page on our site, please contact us and we will help you locate what you require! or for help recommending a loom matched to your weaving level and needs.